Sign in to access client resources. The Segmented Cement Bond Tool (SCBT) provides the operator with an accurate and economic means of inspecting the quality of the cement bond to casing and formation. The SCBT evaluates the cement bond quality and integrity to both pipe and formation by providing the measurements of the cement bond amplitude (CBL) through the near receiver (3-ft crystal), and variable density log (VDL) through the far receiver (5-ft Crystal). The SCBT tool also provide a cement map through eight segmented receivers, each segments covers a 45° section of the pipe. The same bond measurement is available as an analog tool and a high speed digital tool. 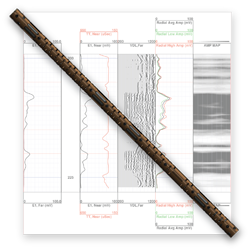 In the digital tool all sonic data is captured and stored digitally within 2 ms allowing flexibility of the output telemetry. This tool is easily configured to customers requirements. The separate acquisition and output module allows changes to the output telemetry to be easily accomplished. The analog tool requires ten cycles in order to transmit all of the data to the surface. This requires slower logging speeds for the same vertical resolution. These tools are designed for high temperature, and high pressure environments. In the near future, this tool will also be available with an interface to Spartek Systems “open architecture” tool bus., allowing for both memory and SRO operations. Rated for High-temperature and high-pressure environments. The output can be configured to emulate most bond tools available today. Compatible with most surface systems. Runs on all standard wirelines. All receivers are built in a slotted housing to provide rigidity, strength, and noise isolation. Electronic design verified for 1 hour operation at 415°F to ensure reliability. Evaluation of cement bond quality and integrity. Location of free-pipe and cement-top.